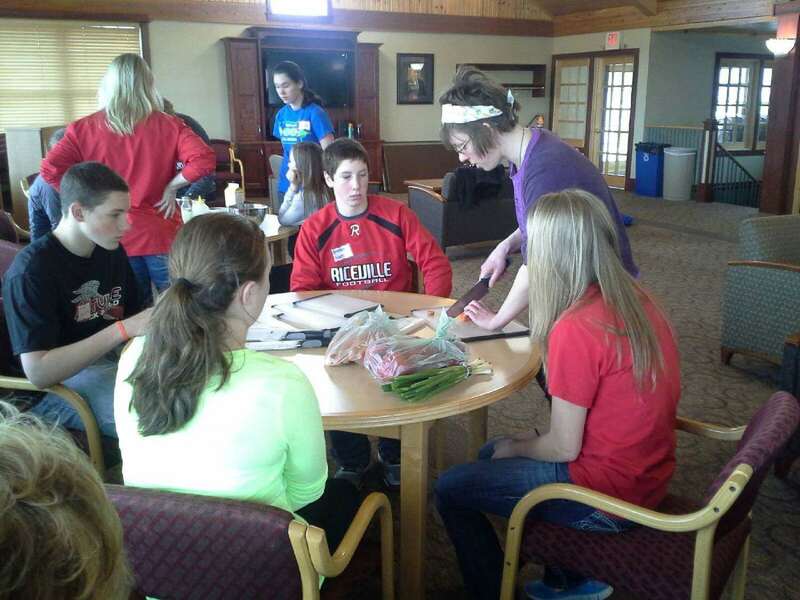 On Thursday, April 25, representatives from 12 regional school districts gathered at Luther College for the fourth and final Regional 4-H Youth Leadership Team meeting for the 2012-2013 school year. Our first three gatherings focused on promoting youth advocacy for healthier school environments and empowering students to share their stories with key decision makers in local schools and communities. This final gathering was designed to celebrate how far our youth 4-H Food & Fitness teams have come and provide youth representatives with hands-on experiences, or experiential learning, to take back to their schools. Students and coaches had the option of attending one of three different sessions each in the morning and afternoon. 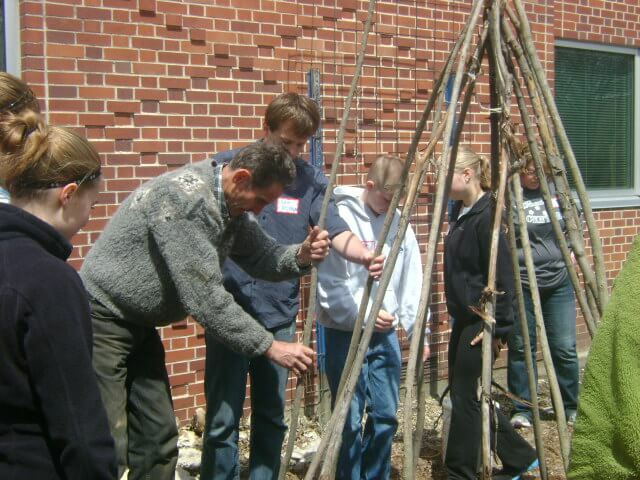 Morning sessions included a lesson in Laughter Yoga with resident expert Laura Gentry, a cooking lesson with FoodCorps member Elizabeth Makarewicz, and building raised garden beds for Decorah’s John Cline Elementary under the guidance of Jeff Scott of Driftless Gardens. Participants came back together as a large group to enjoy a healthy lunch catered by Luther College. Three afternoon sessions followed lunch: a walkthrough of stretches to do at your desk with licensed massage therapist Matt Johanningmeier, a how-to of constructing a garden teepee for beans and other climbing plants with David Cavagnaro of the Pepperfield Project, and a discussion centered on healthy living with panelists Sam Iverson, Decorah high school student, Katie Lay, FFI resource contact, and Emily Neal, Coordinator for School Outreach at Luther College. Food & Fitness received a lot of positive feedback from the day. Following the healthy living panel, one coach stated it was was the most beneficial conversation he’d been in since the beginning of the work. This gathering was a great way to end the school year, and we look forward to picking up next year with all the positive energy created during these sessions! This entry was posted in Central CSD, Clayton Ridge CSD, Decorah CSD, Howard-Winneshiek CSD, MFL MarMac CSD, North Fayette Valley CSD, North Winneshiek CSD, Postville CSD, Riceville CSD, St. Joseph School, Turkey Valley CSD, West Central CSD, Youth Leadership by Melanie. Bookmark the permalink.